The parade of black dresses on Sunday’s Golden Globes red carpet wasn’t the result of a new designer trend. Hollywood elites opted for the dark attire in a show of solidarity with an effort to push back against sexual harassment and assault. The awareness-raising campaign marked a big public moment for the new organization Time’s Up, which has the backing of hundreds of prominent people in the entertainment industry—and ambitions to right wrongs for women of many walks of life. As the #MeToo movement swept across social media in late 2017, criticisms emerged that a disproportionate amount of attention was going to prominent, wealthy women with greater access to the megaphone of the media, leaving many victims of sexual harassment and assault—especially working class women and women of color—struggling with their abusers in anonymity. Then, in November, the Alianza Nacional de Campesinas, a national group representing an estimated 700,000 women working in agriculture, published an open letter of support for women confronting predators in Hollywood, stating that, “We wish that we could say we’re shocked to learn that this is such a pervasive problem in your industry. Sadly, we’re not surprised because it’s a reality we know far too well.” That expression of the universality of what many women face, from the most rarified worlds of the A-listers to farms and packing houses and beyond, seemed to give the then-nascent Time’s Up organization a sense of purpose and direction. 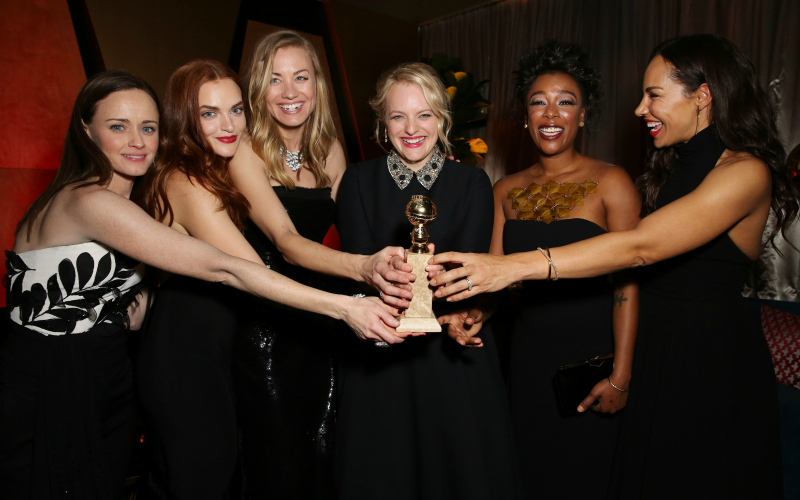 Started as a series of informal meetings in which Hollywood women including Shonda Rhimes, Ashley Judd, Natalie Portman, and America Ferrera were discussing what they could do to confront the enormity of the problem of sexual harassment, Time’s Up has now launched several specific projects and campaigns, including a legal defense fund administrated through the National Women’s Law Center in Washington, D.C. The fund is said to have been seeded with $13 million in donations from the participating Hollywood stars, and established with a mission to support less-privileged women who pursue legal action against abusers in restaurants, hotels, factories, and other workplaces. If seeing the black dresses inspired you to make a donation, that fund is where your money will go, but it’s not the only project that Time’s Up is backing. A group of prominent women in law and business, including Anita Hill, Kathleen Kennedy of Lucasfilm, attorney Nina Shaw, and venture capitalist Freada Kapor Klein, are collaborating on what they’ve named the Commission on Sexual Harassment and Advancing Equality in the Workplace, a group that will create policy recommendations for addressing systemic failings and inequalities that contribute to environments of abuse. Confronting something as vast as the inequity that’s perpetuated gender-based violence and harassment will be no easy task, but the organizers of Time’s Up seem positioned to keep the issue in the spotlight even once this awards season ends.